It is a great pleasure to welcome Dysseldorfer Symphoniker as our customers! It is a great pleasure to welcome Teatro Mayor in Bogota as our customers! It is a great pleasure to welcome Swedish Radio Symphonie Orchestra as our customers and Gema Percussion (Webseite) as our servicepartner in Scandinavia! It is a great pleasure to welcome Tiroler Landestheater / Tiroler Symphonieorchester and Dompfarre Innsbruck as our customers! It is a great pleasure to welcome Leipziger Symphonieorchester Musikhaus Lechner KG as our customers! As of March 2018, you can rent our instruments at Musikhaus Lechner KG (Website)! It is a great pleasure to welcome Murbach Musik AG and Oslo Philharmonic Orchester as our customers! From now on, you can rent our insturments at Murbach Musik (Website) mieten! It is a great pleasure to welcome Norwegian Academy of Music and Stadttheater Klagenfurt as our customers! It is a great pleasure to welcome Mozarteumorchester Salzburg as our customers! 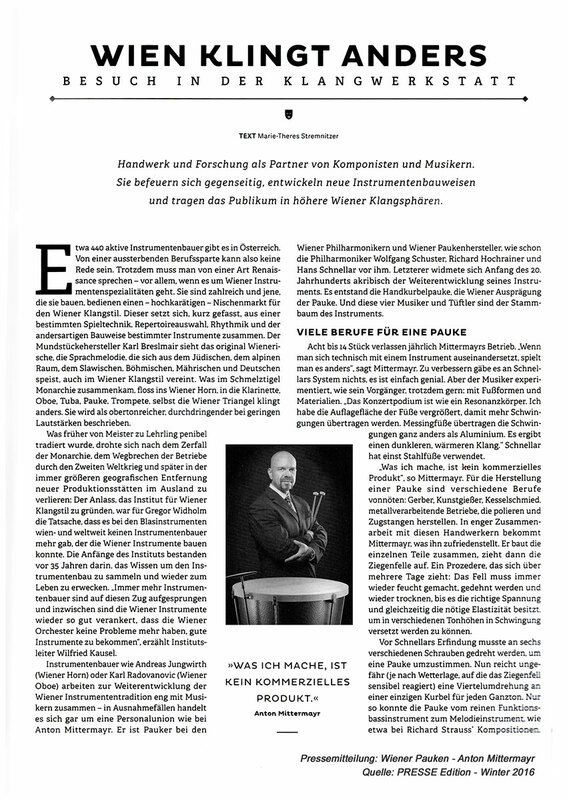 It is a great pleasure to welcome the Universität der Music und darstellenden Kund in Graz Expositur Oberschützen and Volksoper Wienh as our customers! Now and only avialable at only avialable at Wiener Pauken Produktions GmbH - premium goat parchment by "Gerberei EDLAUER" (www.trommelfell.at) - which we have processed and is provided with quality seal! 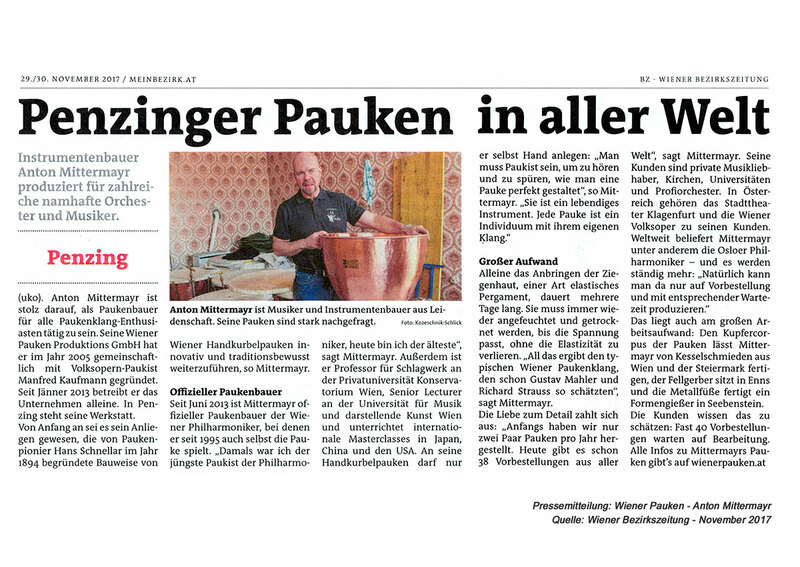 We are very pleased to welcome Philharmoiker Wien-Nagoya as our customers! It is a great pleasure to welcome Opernhaus Graz and Stadthauptpfarre St.Jakob, Villach as our customers! 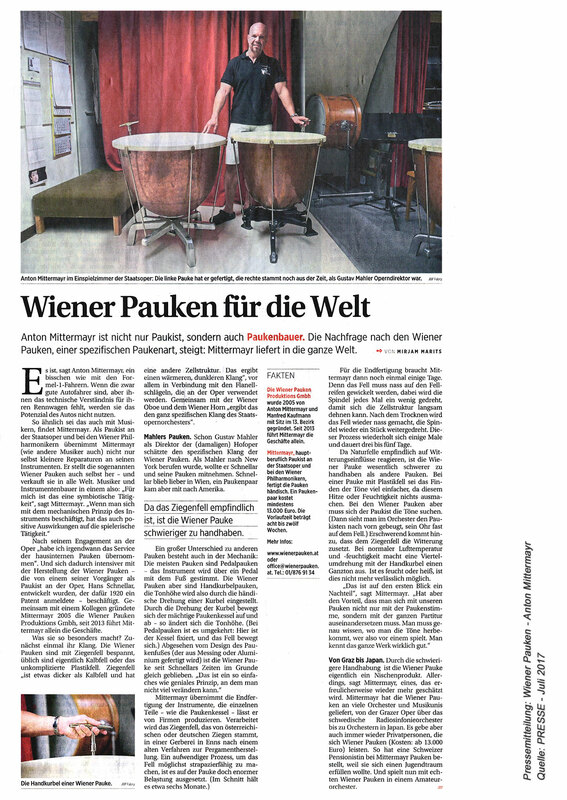 We are very pleased to be able to announce, that as from February 1st 2014 the company „Wiener Schlaginstrumentenbau“ (please visit www.wienerpauke.at) is part of the Wiener Pauken Produktions GmbH. We warmly welcome our new customers!